Something to Muse About: GENIUS - Check out the poster! 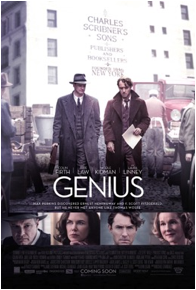 From Academy Award-nominated screenwriter JOHN LOGAN (Gladiator, The Aviator, Hugo, Skyfall) and acclaimed, Tony Award-winning director MICHAEL GRANDAGE in his feature film debut, comes Genius, a stirring drama about the complex friendship and transformative professional relationship between the world-renowned book editor Maxwell Perkins (who discovered F. Scott Fitzgerald and Ernest Hemingway) and the larger-than-life literary giant Thomas Wolfe. Based on the biography “Max Perkins: Editor of Genius” by A. SCOTT BERG, Genius stars COLIN FIRTH as Perkins, JUDE LAW as Wolfe, NICOLE KIDMAN as Aline Bernstein, a costume designer sharing a tumultuous relationship with Wolfe, LAURA LINNEY as Louise Perkins, Max’s wife and a talented playwright, GUY PEARCE as F. Scott Fitzgerald and DOMINIC WEST as Ernest Hemingway.